You should not create a twin! Two or more parts are twins if they have the same sequence - just like two animals are twins if they have the same DNA. In the Registry, twins have come into existence because the author copied the sequence of an existing part, or rebuilt a composite part. You should not create a twin. Instead use the existing part page to document your contributions. You can check if your part is a twin through the sequence analysis tool or by creating a temporary part, adding the sequence, and verifying if it is a twin. 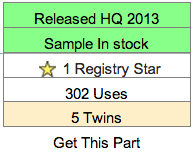 On a part's main page, the part status box shows the number of twins the part has. This section links to the twins page for the part, where you can find out more about the twins. The twins page shows all of the twins for a part.